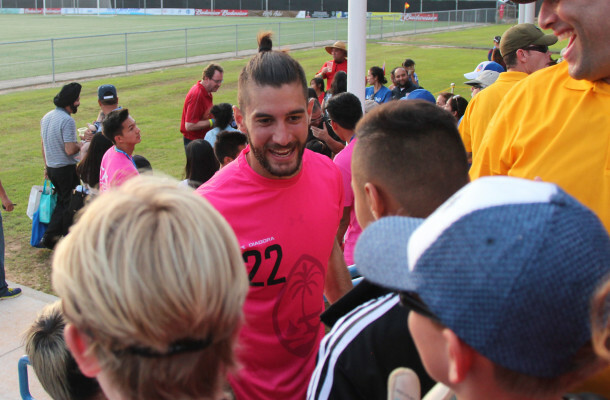 PRESS RELEASE – Matao goalkeeper Dallas Jaye continues to enjoy the fruits of his labor after signing with professional soccer club FC Cincinnati for the upcoming USL season, set to officially kick off next month. Jaye, who officially signed with the club Feb. 15, currently is one of three goalkeepers on FC Cincinnati’s roster for its inaugural season. “Playing soccer at the professional level was always my dream,” Jaye said via E-mail. “Ever since I hopped in goal at age seven, I never looked back. I used to go to San Jose Earthquakes games with my youth teams and watch the pros play, and I wondered if I could reach that point. I used to daydream in school about playing in stadiums with big crowds and against the best players. “The time invested and sacrifices I made (to get to where I am today) are immeasurable, but when you love something and have that passion to succeed, you remain disciplined … the best part about turning professional so far, for me, was seeing how proud I made my family and friends. It’s like I am able to repay them in a way for all the time I’ve had to be away from them,” the 22-year-old added. After playing for various youth teams, Jaye left for IMG Academy when he was 14 years old to pursue the sport more seriously, he said. After two years with the sports academy, he returned home to play for De Anza Force Soccer Club, a member club of the U.S. Soccer Development Academy and was named the academy’s Goalkeeper of the Year in 2010.His success at the academy level and consistent performances in college showcases began to open more doors of opportunity for him and eventually led him to University of South Florida. Next, he transferred to Xavier University, another NCAA Division I college, as a graduate student, and was named to the Big East Conference First Team and Goalkeeper of the Year in 2015. While in college, Jaye also earned valuable playing experience with FC Tucson, a U.S. Premier Development League team. He was among top eligible players named to the 2016 MLS SuperDraft earlier this year. “Signing a professional contract with FC Cincinnati is a massive opportunity for Dallas and is the direct result of his drive to succeed and hard work over the years,” said Gary J. White, Matao head coach. “I’m extremely pleased with his achievements thus far and look forward to seeing him succeed at the professional level. His recent signing, as well as the achievements of his teammates on the Matao, will definitely help our national program develop and gain even more international recognition for us. “He’s a great role model for youth players today – and young goalkeepers in particular – dreaming to one day play for a professional club,” White added. Jaye first suited up for Guam as part of the U19 Men’s National team, before his call-up to the Matao in June 2012. Jaye earned a clean sheet in Guam’s first-ever victory over Macau – a 3-0 win – in an EAFF East Asian Cup Preliminary Competition Round 1 match that same year and later helped Guam finish with a clean sheet in Guam’s first-ever victory over Chinese Taipei in a 2013 AFC Challenge Cup group stage match in Myanmar. Jaye knocked away a Chinese Taipei penalty kick late in the match to preserve Guam’s clean sheet. Jaye earned his most recent clean sheet for Guam against Oman – then ranked No. 100 in the world – in a 2018 FIFA World Cup Russia and AFC Asian Cup UAE 2019 Joint Preliminary Qualification Round 2 match in Guam on Sept. 8, 2015. “My two biggest supporters who I owe the most praise are my parents – my mom and dad have done everything in their power to make sure I have had the opportunities to be the best person I can be and to pursue my passion,” said Jaye. “As I’ve gotten older, I realize more and more just how much they have and continue to do for me. My siblings are right there with them, always having my back and keeping me motivated. I do everything on the field not only because it is my passion, but to make my family proud. Guam Matao goalkeeper smothers the ball on a play during the team’s 2018 FIFA World Cup Russia and AFC Asian Cup UAE 2019 Joint Preliminary Qualification Round 2 match against Oman, played on Sept. 8, 2015 at the Guam Football Association National Training Center. Jaye recently signed a professional contract to play for USL side FC Cincinnati. “I also owe a big thank you to Guam Football Association President Richard Lai for international opportunities, as well as Gary White, Adie Creamer (Matao goalkeeper coach), and my brothers on the Matao team. My experience with the Guam national team has played a massive role in me reaching this level. Gary and Adie, along with the boys, always kept me encouraged and made sure I knew I was capable of playing professionally if I put the work in and kept a positive attitude toward the game. The staff and players at University of South Florida, Xavier University, and FC Tucson have also played big roles – I was so fortunate to be around such good coaches and players the last few years that helped me become a better goalkeeper and even better, a mature young man. Lastly, I need to thank my best friend in the game Wesley Charpie. Wes and I were roommates together my four years at USF, and we have always dreamed out loud together about being professional soccer players. Last year I got to see Wes get drafted in the MLS Superdraft, where he was taken by Toronto FC. He played his first pro season this past year with Toronto FC II (USL) and always gave me advice about what he learned along the way, which I have been able to apply in my own experience.As you can see, I have been so fortunate to be surrounded by such great people along the way. I would not be the player or man I am now without each and every one of them,” Jaye added. The Matao next play in a FIFA international friendly match against Chinese Taipei on Mar. 19 before flying to Oman to play its final match of FIFA World Cup Round 2 qualification. FC Cincinnati plays its season opener against the Charleston Battery on Mar. 26 in Charleston. The team’s first home match will be against Charlotte Independence at Nippert Stadium Apr. 9, according the FC Cincinnati Web site. Jaye is the second son of Jeff and Barbara Camacho Jaye of Danville, Calif. He has one older brother Tyler, one younger sister Spenser, and one younger brother Noah. Spenser Jaye currently is a midfielder for the University of Hawaii at Manoa women’s soccer team and looks to also represent Guam in international competition. Noah Jaye suited up for Guam with the Boys U14 national team in 2013 and also joined the team last year.